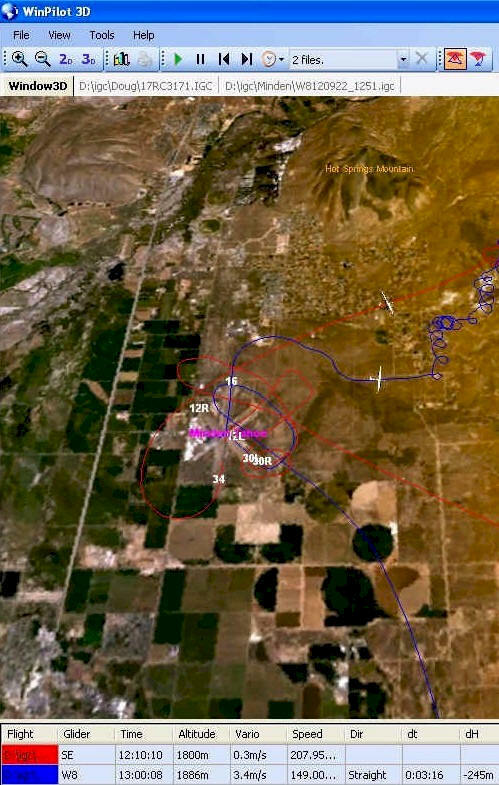 WinPilot 3D is flight analysis and planning software, that lets you zoom in from satellite altitude into any place on Earth, leveraging Landsat satellite imagery and Shuttle Radar Topography Mission elevation data. 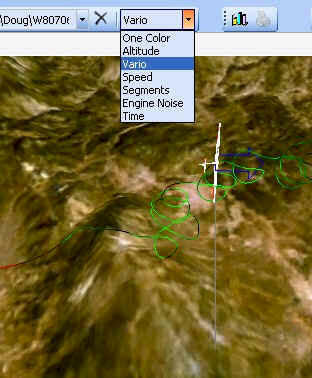 WinPilot 3D lets you experience Earth terrain in visually rich 3D, just as if you were really there. 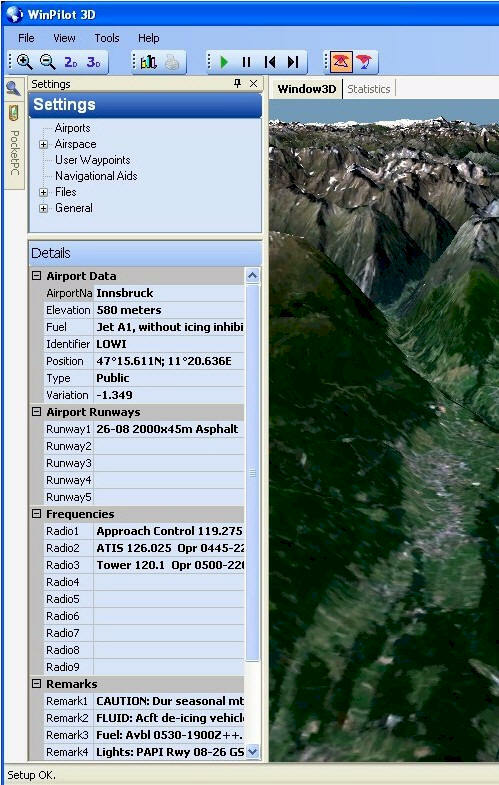 WinPilot 3D also shows airspace in 3D, and contains world-wide database of airports and runways. It allows preparing a task, transferring it to a Pocket PC, and then analyzing the resulting flight log after the task in finished. 1. Open a wave flight log using File.Open. 2. On the Toolbar, switch from 'Thermal Flights' to 'Wave Flights'. This enables wave segment selection buttons (see left), and sets them into the 'Select Start of Wave Segment' mode (see left). 3. Touch a portion of a flight log where you want a given wave segment to begin. This will change the color of that spot to blue, and change the default button to 'Select End of Wave Segment'. 4. Touch a portion of a flight log where you want a given wave segment to end. This will change the color of that spot to brown, and draw this wave segment on the screen. 5. If the segment is located properly, click the 'Plus' wave button to add that segment to the local database. If you want to change this segment, press the 'Delete' wave button (red square), and start over, or press 'Start' or 'End' wave, and edit these locations. 6. After all wave segments for that flight log have been added to your satisfaction, you can upload them to our global database using Statistics.Thermals.Send To Internet. Note: If you are preparing for a wave flight, you can also select 'Wave Flights' on the main Toolbar. That will narrow the focus of the On-Line Thermal Browser to only download wave spots, when the 'Fetch Thermals' button is pressed. Uploading Thermals and IGC files to our web site can be done via Statistics.Thermal window. When a new IGC flight is open on your local computer using Menu.Files.Open, A new Tab should be shown next to the 3D Window tab, showing the IGC file name (see picture on the left). This is the Statistics Tab. By clicking it, and then by clicking Thermals it is possible to see all thermals in the selected file. These can be then uploaded to the web site by pressing the 'Send To Internet' button. It is possible to select which thermals should be uploaded and which not by first selecting a thermal, and then pressing the 'Add/Remove' button. To see the exact location of a given thermal on the 3D map, press the 'Show' button while the 3D window is visible. After the the proper thermals are selected, press the 'Send To Internet' button. The person who submitted the thermals, has then an option to remove them from our web site by pressing the 'Delete From Internet' button. Includes Airport elevation, runway numbers and layout, Radio frequencies and remarks.